so, remember when i said last month that i was not going to budget for may because i “didn’t need it”? yeah, i’m crazy. my confession this week? i definitely needed it. i think i may be a tiny bit of a shopaholic. one of my favorite things about “blog land” is the camaraderie around interests. mine tends to focus a lot on things. clothes and makeup, specifically, are my weakness. some people have booze, the gym, sports… not me, i choose shopping. shopping is my cardio. so one big confession this month: i overdid it. and i feel bad i did, but i like what i got. so sue me, i guess. first it was Golden Tote. then it was the Nordstrom Semi-Annual sale. i don’t discriminate, i also spread the money around to Etsy and Ulta too. so who wants to see what i got? i figured. yeesh. all totaled that’s over $600. so, i think it’s time to hop right back on the shopping budget bandwagon. i’m going to challenge myself to spend under $150 in June to make up for my bad behavior. i mean, let’s just face it. i have a slight shopping problem. it’s not going to put me in debt or bankrupt me anytime soon, but i probably don’t need to spend that much in the near future. to make myself feel better though, i bought one of you lucky ladies (or gentlemen, are there any of you out there?!) a present. 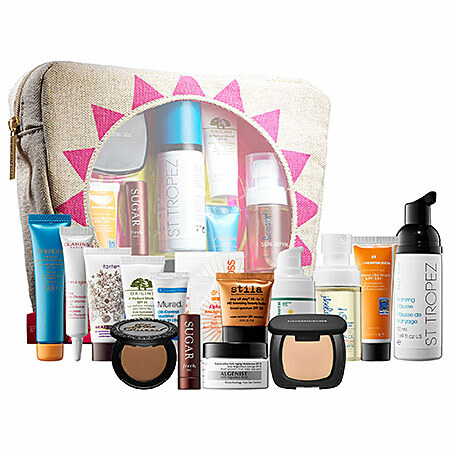 to celebrate 500 followers on Bloglovin’ and 600 followers on Twitter, you can walk away with the Sephora Sun Safety Kit, which is now sold out from Sephora. woohoo! anyone else have a shopping problem they’d like to confess? I definitely over did it during some memorial day sales! I definitely needed the bikinis haha! I rationalized it by saying a lot could double as work clothes, if I pretend like every day is Friday! haha! that’s a great rationalization. i haven’t even bikini shopped yet, its probably my least favorite thing to shop for! Honestly, I totally relate. When my grandma died in October, I never wanted to be at home alone or by myself ever, so I would just go shopping like, every day. However, I feel that I ended up using it as a coping mechanism and actually developed a kind of emotional dependence on it – so I definitely have officially been legitimately addicted to shopping. I managed to curb my impulses some, but now that I’m married and we joined bank accounts, I’m trying to go cold turkey. It’s really hard. Online shopping + unnecessary grocery shopping for the heck of it is basically where I’m struggling right now. But your challenge sounds like a good idea. =] i need to do something like that too! so sorry to hear about your grandma, Haley. i’m really glad you were able to figure out your coping mechanism and make the changes that were necessary for your family. online shopping is probably my biggest weakness – its too easy and i absolutely hate shopping at the malls anymore! challenges definitely help me really take a second look at some of those impulse buys! I’m such a shopaholic myself so I totally get it! Being outside in the sunshine! haha! acceptance is the first step, right? oh i bet! cities are insanely spendy to live in! hope you have a fun time in Memphis! good luck! so impressive! i’m terrible on a bike. good luck, Melanie! ha, i am so glad i’ve found my “tribe” with this post! seriously, i am the worst at shopping without a budget. have a great weekend, Lisa! I can’t wait to just relax! Is that bad? CONGRATS on your recent milestones!! Hugs to you! awesome, hope you have fun here! :) good luck, Ashley! Wait! So you legit own all that cool stuff now? I’m too jealous for words right now! ha! don’t be too jealous, still gotta pay the bills for my naughty shopping this month. eek! I am looking forward to going camping with my kids. sounds fun, good luck Shelley! At least you got a lot of stuff for your money!! And you are happy with it :), but here’s to budgets. seriously, budgeting is definitely needed to make up for last month! i know right? i keep justifying everything because its for summer… or for a trip. oops! I always tell myself not to spend money but then something catches my eye! I never really tally it up, eek i don’t want to! tallying it up is the worst part! makes you feel so guilty. oh well, that’s what budgets are for! I somehow managed to not spend any money last month.. I don’t know what happened ha ha. I’m looking forward to hikes this summer!! i have vowed to take a ton more beach trips this year! Spending more time with my babies & less time working!! I go through shopping phases- right now I am in a bad spending one! glad i’m not the only one! definitely going to be watching my spending this month. fingers crossed for you, Tara! Trips to the lake & lots of baseball games are on the calendar! sounds like a lot of fun, Kim! good luck! Good luck with your budget!! I am so excited to not have to wake up for work this summer. Girrllll I’m such a shopaholic. It’s so bad. I online shop on my lunch break allll the time! I mean come on, a girl needs to replenish the summer wardrobe right? Haha. My weakness though is handbags….cannnoootttt pass a good one up. I should probably join a support group or something haha. haha, glad i am not the only one! i had a terrible time with not spending when i worked in retail. when its right in front of you its so hard to say no! haha, i wish i hadn’t spent so much, but thanks Chelsea! good luck! I am most looking forward to long days, lots of sunshine, and picnics :) Of course, there are also a few summer weddings that will be the events of the year!! Yay! sounds like you have a busy summer planned, Michelle. good luck! haha, yeah not my finer moment of “budgeting.” good luck! I am definitely a shopaholic too! I’m never brave enough to tally up all that I buy each month, but I’m sure that it’s a lot. Although it has slowed down with being pregnant, I spend less on clothes now which helps! :) Hope you manage to stick to your June budget! First, and most importantly, watching the kids play in the warm sunshine, and secondly my vacation with my husband in Punta Cana!! sounds like tons of fun, Nicole! good luck! aw, congrats on your puppy! they grow up so fast. good luck! I am so looking forward to taking my kidlets to the spray parks and soaking up all the sun!! sounds fun! good luck, Erin! Dipping our little ones toes in the water at the beach for the first time! aw, enjoy and thanks for entering! I cannot wait for hot river days!!! I’m looking forward to being warm and spending time outdoors. I excited to go camping and kayaking and hiking! I adore summer! sounds like fun! good luck, Kassie! I am going to the beach and spending time with family and friends! I’m looking forward to beach fun. Im looking forward to visiting my sister and brother in Fort Worth Texas this summer. It’s been a while since i seen them and im so excited to see them. aw, sounds like it will be a great trip! good luck, Nicole! I’m looking forward to festivals, farmer’s markets and free outdoor music with friends. Nice haul! I didn’t get to do much shopping myself last month but I did find a couple of cute outfits for summer on sale. I am looking forward to going to Myrtle Beach this summer with my fiance’ for a much needed vacation! thanks Dana! I’m definitely taking it easy this month to make up for it ;) Myrtle Beach sounds so fun – hope you have a great time! I am looking forward to going to visit my Sister and getting away from everyone else! Sitting somewhere, drinking a glass of wine……. NO men or kids about.. This summer I am looking forward to spending time with my family and friends! Also, I plan on tackling some projects I’ve been putting off! So many things! beach, bike rides, hikes, gardening… and just not having to bundle us all up to outdoors will be glorious!!! sounds like fun! thanks for entering, Abigail! I’m looking forward to vacations with family and friends! Thanks for the giveaway! I am looking forward to lots of outdoor time this summer! me too, Carly! Good luck! We are looking forward to having a few parties and playing bean bag toss. sounds fun. good luck, Sharon! oh no! :( well, good luck! congrats, Lizze! thanks for entering! I’m looking forward to picnics at the lake! sounds fun! thanks for entering! Nice group of products! After a harsh winter, I’m looking forward to enjoying the warm weather, from my porch, of course, with a drink in my hand! sounds perfect, Talia! thanks for entering! This winter was such a long one that I’m looking forward to sunshine on a consistent basis, lol! I’m also looking forward to taking a 2 week staycation/vacation with my family. We are going just a few hours away to do some local stuff. :) Great giveaway, thanks for the oppty. congrats, Jayme! thanks for entering! I’m looking forward to barbecues and and movie nights. me too! good luck, Priscilla! I looking forward to taking my children to the water park this summer. I am looking forward to enjoying fresh fruits, berries, and vegetables. I’m looking forward to spending more time in nature. I am looking forward to family vacation. I look forward to going camping! sounds fun, Niki! good luck! Hi! This Summer I’m most looking forward to swimming. I don’t care if it’s the beach or the pool it’s always so fun & refreshing! Thank-you for this generous giveaway!! I’m looking forward to some relaxation time- maybe even a few days sleeping in- and the pool! sounds great, Jessica. good luck! I want to go swimming! sounds fun, Brandy! good luck! im looking forward to time outside! I can’t wait to go to the beach. This summer, I’m looking forward to attending outdoor festivals! I’m looking forward to traveling to South Africa this summer. wow! sounds like a fun trip – good luck Elizabeth! sounds like fun, Laurie! thanks for entering! I am looking forward to learning chinese. impressive! thanks for entering, Sky! Eating breakfast on the deck and listening to the birds. sounds relaxing! thanks for entering Karen! sounds fun, Jennifer! thanks for entering! I’m looking forward to gardening in sunny Florida this summer. Sunscreen is a must here! Camping,water parks and picnics in the park with my two boys. sounds like tons of fun! thanks for entering! me too on the reading! good luck, Dee! I am looking forward to swimming, camping & biking! Hopefully, a lot of boating and road trips ! I am looking forward to not working full time and spending more time with my grandson. This summer i’m looking forward to lots of swimming, fishing and gardening. I also look forward to wearing my sundresses (which I can’t seem to stop buying). ha! you and me both, Danielle! thanks for entering! I am looking forward to relaxing by the pool with a good book this summer. I’m looking forward to spending time outdoors and enjoying the weather! I am looking forward to my summer trip to Boston. sounds fun! good luck, Darlene! aw, congrat Patricia! thanks for entering! Going to the beach in September! My first vacay in 10 years! sounds fun! thanks for entering, Lori! I am excited to go to the beach! good plan! thanks for entering Lesley! I can’t wait to get out and do some of my favorite activities like kayaking, hiking, camping, and just being outside enjoying nature. sounds fun, Stacy! thanks for entering! I am excited about being able to spend lots of time this summer with our grandchild. fun! have a safe move, Shane! im looking forward to going to the beach. sounds fun, Amanda. thanks for entering! I am looking forward to going to the beach. I’m looking forward to visiting my husband that has been over seas for almost a year! I am looking forward to beach days with my family! I look forward to traveling! I’m looking forward to a beach wedding! I am most looking forward to spending time with the grandchildren.